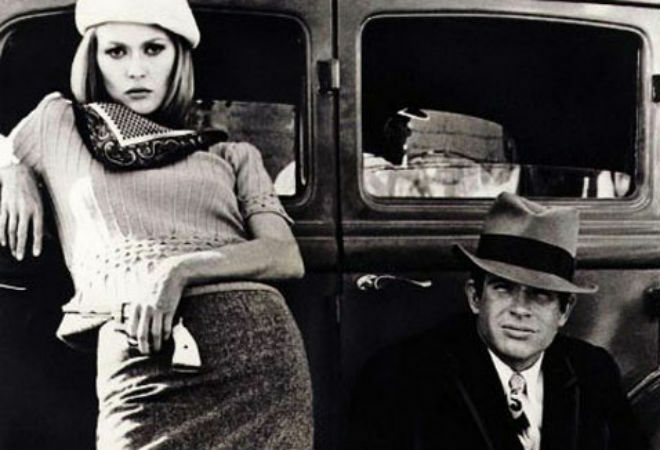 “Bonnie & Clyde” was Warner’s biggest hit since “My Fair Lady,” and Hollywood was never the same after it came out. By the time the 1960s were closer to the ‘70s than the receding ‘50s, the culture was shifting seismically under the noses of studios whose taste still ran to Lerner and Lowe as the rest of the world tuned in to Lennon and McCartney. Producer Warren Beatty was canny enough to try and recruit Bob Dylan as Depression-era Texas bank robber Clyde Barrow opposite either Tuesday Weld (with whom Beatty worked on the TV show The Many Loves of Dobie Gillis) or Natalie Wood (with whom Beatty worked in first feature Splendor in the Grass) as Barrow’s lover and partner-in-crime Bonnie Parker. Spared by fate from the truly terrible idea of Jean Luc-Godard directing, Beatty aspired to his own version of the French New Wave and instead launched an American movie revolution. He attached director Arthur Penn, not really the American Godard but a renegade nonetheless, whose first feature a decade earlier had been The Left Handed Gun, a subversive interpretation of Billy the Kid as reconsidered by Gore Vidal; so Penn knew from misunderstood outlaws. A spoof of Warner Brothers gangster flicks morphed into a fraught collision of tones and rhythms—slapstick peaking just before a bank teller’s face explodes in blood—with a self-awareness that preceded anyone knowing what “postmodern” meant. The irony of an impotent Barrow personifying a highly sexualized decade was compounded when the already legendary horn-dog Beatty took the role (in a previous script Clyde was gay, more ironic still). Cast as Bonnie was the little known Faye Dunaway, who beat out the eternally regretful Jane Fonda and became the actress of the moment. Mogul Jack Warner despised the picture and for some reason wasn’t mollified by the star-producer’s insistence that in fact the “WB” of the studio’s logo stood for Warren Beatty. Before the movie was championed by fledgling critic Pauline Kael, one disapproving reviewer for a national newsweekly panned it until a second screening revealed, as the smoke cleared, the train leaving the station; at that point he hastily boarded, when his second assessment in a week loved everything he had hated. Six months after being dumped in drive-ins to what appeared inevitable ignominy, Bonnie and Clyde was nominated for 10 Academy Awards and became Warner’s biggest hit in four years since My Fair Lady (by Lerner and Lowe). Hollywood was never the same again—or not for the next eight years or so, anyway.